Walking along the highway, crossing through homeless camps, stepping over garbage and god knows what else, I finally fulfilled my desires to explore Freedom. 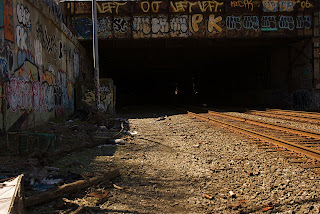 On a pleasant, sunny NY morning I decided it was time to explore the tunnel that always sparked my curiosity. When I arrived I was a kid in a graffiti candy store. Not sure what or who I might come across I entered and was greeted by remnants left behind from whomever lived there previously or now. Old books, toys, lots of shoes, beds, and of course tags left from visiting artists lined the walls of this tunnel. This underground gallery left lots to see, and I was pleasantly surprised to see graffiti tags that I had randomly photographed before. The trains that came through were kind enough to blaze their horns to make us aware of there arrival. Not being able to capture as much as I wanted to due to my lack of a tripod, I will be trekking back here again.